This book was just mentioned on the Pittsburgh Post-Gazette’s summer reading list and coincidentally, I just finished reading it! “The One That I Want” is about a woman named Tilly who is a guidance counselor in the same high school that she grew up in and she’s pretty satisfied with her life – married her high school sweetheart, hopefully trying for a baby on the way. One day, she visits the town festival after work and runs into an old friend that she grew up with who is a fortune teller of sorts who does something to Tilly and tells her that she will now have clarity. Tilly brushes her off until she all of a sudden blacks out and sees a vision, which ends up coming true. She keeps having blackouts and visions and eventually figures out what triggers them and is able to do it on-demand. Tilly knows that there’s nothing she can do to stop or change it because it’s obviously all happening for a reason. While she was out living her lovely little life, things were starting to fall apart and she has no control over it. Typically, I would go into more detail about the storyline up to a certain point, but I think that you should pick up the book and read it yourself if you want to learn more. Telling you what the visions are and what happens would ruin all of the surprises and page-turningness (I think I just made up a new word). This is one of those stories that makes you realize that no one is perfect and life isn’t perfect. Sometimes things just don’t go the way you want them to, but it’s destiny and you just have to let it happen and then adjust your life from there. The book was really easy to get into and it was hard to put down! This is Allison Winn Scotch‘s third book; I’ve also read and blogged about her second book, “Time of My Life“, and want to read her first book someday, too. You can also find her on Twitter and Facebook. Personally, I like her cute and witty comments on random things and her running commentary on the TV show “The Bachelor” (or Bachelorette). She live tweets during each episode – love it! I had only first heard of Allison Winn Scotch when I came across her profile on Twitter (@aswinn). 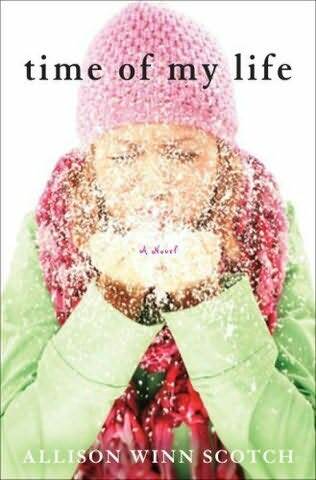 Then more recently, this book showed up on the list of 100 top chick lit novels and I knew it was a must-read for me. “Time of My Life” reminded me of that movie “The Family Man” with Nicholas Cage… but with the opposite situation. In that movie, Nicholas Cage’s character is a career-obsessed bachelor who then wakes up one day in what his life would have been: married to his sweetheart and with a cute little daughter. In “Time of My Life”, Jillian is a housewife who spends all of time cooking, cleaning, and tending to her young daughter and her always-traveling-for-his-career husband. When her massage therapist unblocks her “chi” after she finds out that her ex-boyfriend is getting married, she wakes up seven years in the past, still in the relationship with that ex-boyfriend. After she realizes that she can’t get back to the future to her husband and daughter, Jillian takes it upon herself to try to change the future and see what would happen if she does things differently. I hate to say much more because I don’t want to ruin the story for anyone else. I find that I enjoy a book much more when I don’t know what’s going to happen next. This book actually made me think (and that doesn’t happen too often for me with a book!). Even though this situation obviously couldn’t happen in real life, it makes you think about “what if” and makes you really appreciate what you have now. How would you feel if you were sent back in time and couldn’t have it anymore? I liked Allison Winn Scotch’s writing style – very easy to read and it was entertaining and kept my interest throughout. She has another book currently out, “The Department of Lost and Found“, and one that is being released in June 2010, “The One That I Want“.